Weight Loss and Hypothyroidism Diet. Hypothyroid is a condition in which the thyroid is underactive and this makes your metabolism significantly low. The result is that you burn less calories than usual each day. In spite of your regular medication, weight loss targets seem far than an achievable target. Well but that doesn’t mean you have no hope at all. It simply means that you need to work a lot more harder to achieve your goal of trimmed waist line. 1. Complex carbs with fiber are your best friends. These will keep you full and avoid overeating. Incorporate vegetables like ladies finger, mushrooms, cucumber, tomatoes, zucchini etc. and fruits like apple, avocado, grapefruit, melon, kiwi etc. Mushroom and Green Capsicum Subzi and Citrus Watermelon Salad. 2. Pile on proteins. Opt for a variety of dals, pulses, lentils and sprouts and bring on table Moong Dal ki Chaat or simple Masoor Dal. These aid in boosting metabolism and assisting weight loss. 3. Try going gluten-free. It helps in weight management to some. Amongst the cereals prefer cooking Healthy Oats Dosa or Minty Quinoa as quinoa, buckwheat and oats are the best for you. 4. Use taste enhancing herbs. Try turmeric, parsley, cinnamon, mixed herbs etc. 5. Have Iodized salt. This is because iodine deficiency is one of the cause for hypothyroidism. 6. Befriend berries. They are rich in antioxidants which reduce inflammation. 7. Hydrate yourself well. 10 to 12 glasses of water daily will help your metabolism work more efficiently. 8. Eat slowly. This will help overeating and aid in better digestion. 1. Your pantry need not be stocked with processed foods. These include plain flour (maida) and its products like breads, pizzas, burger etc. 2. Ready to eat foods and packaged foods are a complete No-No. They contain too many unnecessary calories and fat. 4. Few other vegetables are also best avoided. This list comprises of corn, asparagus, radish, spinach, sweet potato, potato and mustard greens. 5. Eliminate nuts with thyroid inhibiting compounds. Almonds, cashew, peanuts, flax seeds, walnuts, and pine nuts are a part of this. 6. Shun away coffee and alcohol. They are needless stimulants. 7. Eliminate all sugar laden products. Cakes, pastries, custards and jellies - all cause excess glucose in blood, which gets converted to fat and deposited in body. 8. Avoid fried food for sure. You very well know they are the unnecessary calories you can definitely skip. Try nourishing non-fried tikki like Oats and Moong Dal Tikki. Here are 4 basic suggestions to help you going achieve weight loss…. 1. Firstly, get your thyroid levels checked and work with your doctor on medications which help you balance your hormone levels. 2. Secondly, enhance your workouts and training program. If you aren’t working out, you are at risk of piling more and more kilos. The monitored physical activity for at least an hour will help you burn fat and tone up your body. 3. Finally follow it up by eating healthy. This is in reality more crucial. You are what you eat. 4. Get enough sleep. It assists in better hormone control. 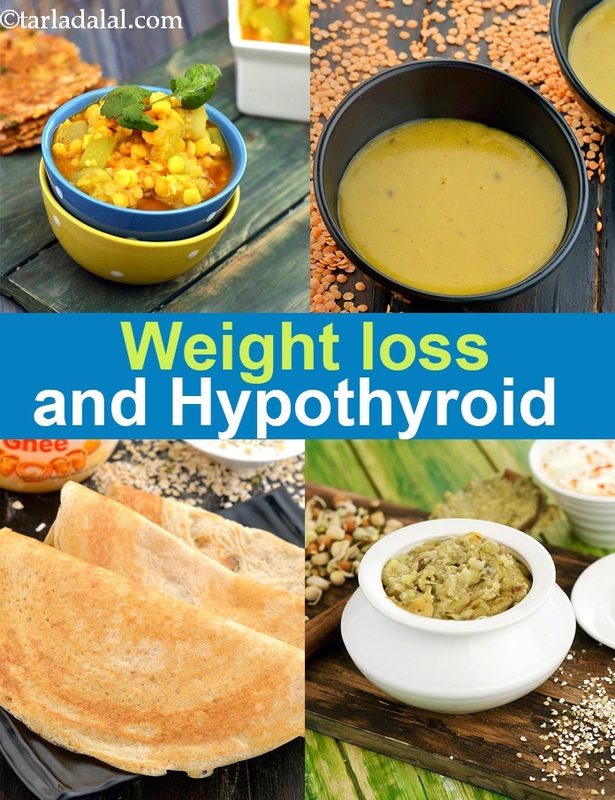 Enjoy our Weight Loss and Hypothyroidism Diet, Thyroid Diet for Weight Loss, Indian Recipes and other thyroid recipe articles below. A healthy and tasty, nutritious and flavourful snack indeed. Pomegranate and raw mangoes perk up this colourful chaat. Well now this is not the usual vegetable soup that you make often for your family. The way of preparation remains unchanged but ingredients used are quite different. Vegetables used are only zucchini and carrots while the baharat powder completely alters the taste of this soup.